JP Aerospace is an interesting company – in the city of Rancho Cordova, CA., California.. Their aim is to develop ways to send airships up into the stratosphere – and more controversially, all the way to orbit with their “Orbital Airships” vision. The airships would accelerate very slowly, at a rate of perhaps a few centimeters per second increase in speed every second, over several days, until they reach orbital velocity. Can they, or can’t they, or how far can they go? If you do it the other way, build airships to re-enter Earth’s atmosphere from orbit, then this is much more widely accepted to be possible, with many scientists exploring plans such as the VAMP proposal for atmospheric re-entry for Venus, Titan and Earth by an airship that inflates as it re-enters, and slows down because it presents such a large surface area to the atmosphere. Also there was a 1964 test of a small inflated paraglider that achieved hypersonic speeds of over Mach 3 at a height of 400,000 feet, though only for minutes. So hypersonic flight by airships seems to be feasible in principle at those heights, but how fast and for how long? It is also definitely possible to have an inflatable in orbit, from the Echo project, which used inflated balloons as satellites for communications purposes. Throughout this article, page numbers refer to John Powell’s book “Floating to Space, the Airship to Orbit Program“. The most controversial part is their idea of slowly accelerating to orbit. Their airships would be constructed and inflated at an altitude of 140,000 feet on a high altitude platform, his “Dark Sky Station” so called because it is so high in the atmosphere that the sky there is dark, just as it is when seen from space, even at midday. They would be far too flimsy to survive at ground level, but would be fine for flight at that height above all the weather in our atmosphere. Passengers would travel up to this platform in a more conventional stratospheric airship, then transfer to the orbital airship for the final stage of their journey. They then slowly accelerate to orbit over a time period of several days. 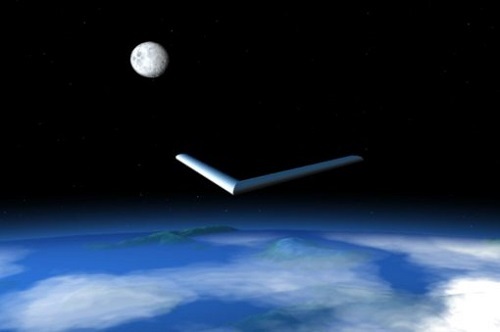 Artist’s impression of JP Aerospace’s orbital airship in orbit. It would get here by slowly accelerating over a period of several days, with the speed increasing at a rate of centimeters per second every second. Do that for several days – and if you can also have enough lift to stay high in the atmosphere above the denser layers of the atmosphere to avoid having impossibly high levels of drag – and you will eventually reach orbital velocity. That is, if you can find enough power, make the airship light enough, if an airship can survive flying at hypersonic speeds in a near vacuum, if it can generate lift, enough to stay above the denser parts of the atmosphere as it gets faster and faster, etc., etc. The idea has been used in science fiction, for instance for Geoffrey Landis’ “Sultan of the Clouds” about traveling to and from the clouds of Venus using a similar orbital airship. He says that the V shape of their airship is optimized for hypersonic flight at Mach 3 and above in a medium to hard vacuum. It, never lands. It is too fragile, and would blow apart in a gentle breeze. It leaves and returns to the Dark Sky Station at 140,000 feet. He says that their 18 kilometer long model would take 20 tons to orbit (page 124) which is not far off as the payload of the Falcon 9 full thrust. If it works, he thinks that they can do it at far lower cost per ton than conventional rockets, and of course the whole airship is fully reusable with nothing discarded except the fuel. This gigantic orbital airship is the very end point of the program. They would build up to it over many stages, of smaller airships and other designs, able to fly at 140,000 feet and a bit higher, then higher still, and eventually a small orbital airship, and then finally this one. Right now they are flying smaller airships of the same basic design but with a tougher skin and designed to fly from Earth up to 140,000 feet eventually (so far they ahve reached 15,000 feet). They also test high altitude balloons and structures and one of their main activities is taking “pongsats” up to high altitudes for schools.. Solar power using vast kilometer square solar panels using thin film solar cells only nanometers in thickness integrated into the material that makes the airship skin. These would be used to accelerate the exhaust of conventional rocket fuel to get much more thrust from the same amount of fuel as a “dirty ion thruster” with performance in between a rocket and an ion thruster, both in terms of the amount of thrust and the amount of fuel needed.. The Dark Sky Station would be constructed from numerous large balloons that would be swapped out in a maintenance cycle every few months. See “Dark Sky Station” section below. On that second point, the idea of a “dirty ion thruster” is that it has charged ions mixed with the rocket fuel. The ions are created by combustion as in a flame then accelerated electrically as in a conventional ion thruster, which helps to accelerate the unionized fuel too, rather like the operation of a rail gun. So it’s got more thrust than an ion thruster but has less thrust than a rocket. It doesn’t generate enough thrust to hold up its weight against gravity so it needs a combination of aerodynamic lift and thrust once it gets above the buoyancy limit. It also needs more fuel than an ion engine but a lot less fuel than a rocket. There are numerous other detailed challenges and responses. Of course the physicists who criticize him then challenge the practicality of these solutions. If the physicists who say it can’t be done are right – how far can he get? Can he achieve airships that fly several times faster than the speed of sound in the high upper atmosphere like the 1964 inflated paraglider? What about his “Atmospheric escape airship?” Can these airships launch from the Dark Sky Station and take passengers up to heights of 200,000 or 300,000 feet? What about his Mach gliders? 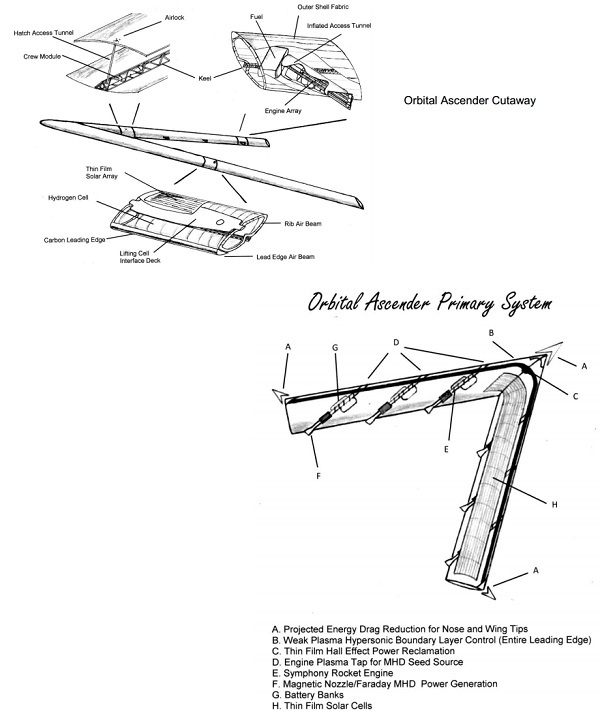 Those at least should work, based on the 1964 experiment, and could be of scientific interest in themselves, hypersonic inflated gliders traveling in the upper atmosphere until they get too low to fly. He is not suggesting any new physics like the EM drive, so it’s not controversial in that sense. Rather, the reason it’s controversial is because we have almost no practical experience of huge airships traveling at hypersonic velocity in a medium to hard vacuum to draw on. He is doing a lot of extrapolation on the basis of his own wind tunnel experiments and rather limited data. So, what makes it so controversial is that this is a different regime from any current experience of ordinary flight. He is talking about kilometer scale airships in a near vacuum that stay aloft through a combination of buoyancy and aerodynamics, and eventually also through ballistic motion as they approach orbital velocity. This also means that in the course of trying to get his airships to fly, he will get this practical experience and that will help refine our understanding of what happens in practice to airships that attempt to fly in these extreme conditions. We do have some examples of hypersonic flight of rather small airships, or balloons – including that 1964 test, and some other similar examples (ballutes, ICBM mylar inflated decoys), but none of that is powered flight. We don’t have any examples yet of airships that can reach speeds anywhere near to breaking the sound barrier under their own power. If he doesn’t achieve his orbital airships, I think we will still learn a lot from that experience of trying, and who knows where it might lead in terms of new applications. It is possible for an airship to have aerodynamic lift. Some hybrid airships are heavier than air, and depend on aerodynamics combined with buoyancy to stay afloat. 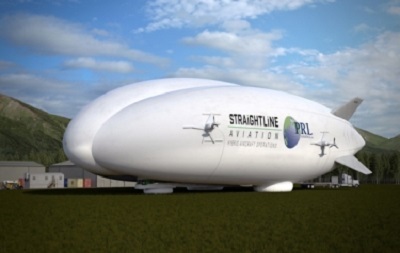 The Lockheed LH-1 is a heavier than air hybrid airship which is going to be used to move freight and personnel to remote areas of Alaska and Canada. Still, though these hybrid airships still stay up mainly on the basis of buoyancy, with a little aerodynamic lift to assist. Also they could not travel anywhere close to the speed of sound without breaking up. Meanwhile, conventional planes, can fly at supersonic and even hypersonic speeds (some of them). However, they are heavier than air, and are unable to fly higher than the Karman line. This is at 330,000 feet, and above this height a heavier than air airship has to travel faster than orbital velocity to generate enough aerodynamic lift to support its weight. ESA invests in 4,000mph hybrid rocket jet engine firm, a Mach 5 airplane. Any heavier than air plane like this will be restricted to flying below the Karman line at 330,000 feet, the height at which you need to go faster than orbital velocity to achieve enough lift to hold up the mass of your plane against gravity. JP Aerospace hope to go above this height using airships balanced to be neutrally buoyant at up to 180,000 feet, and then to fly higher than that through a combination of aerodynamics and buoyancy. In this way, by making their plane much lighter, they plan to “beat” the Karman line restriction. However, that’s for heavier than air vehicles. What happens when you combine buoyancy with aerodynamic flight, at hypersonic speeds, and what’s more, do it in conditions that would count as a hard vacuum in a laboratory, at a height of 300,000 feet or more? First, could you do it just with buoyancy? Well in theory, perhaps, if we had the materials to do it, then we could float a sufficiently huge balloon above the denser part of our atmosphere even at the height of the ISS. So long as there is hydrogen inside, and higher molecular weight gases outside such as nitrogen and oxygen, it doesn’t matter how thin the vacuum is. The principles are the same, and a balloon will still float, so long as there is some atmosphere, even if it counts as a medium to hard vacuum, for it to float in. However, we don’t have the capability to do that. Even the thinnest materials would be far too heavy for a balloon at the height of the ISS. But what is the highest point at which a balloon can float? Well the world record so far is the JAXA BU60-1 experiment which was 74.5 meters in length, 53.7 meters in diameter and weighed a total of 39.77 kg including instruments. It reached an altitude of 53 km, or around 174,000 feet. This is just short of the height where JP Aerospace eventually plan to build their Dark Sky Station, where passengers will disembark to transfer to their orbital airships. 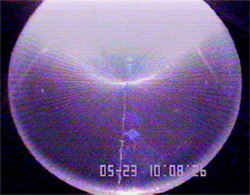 The BU60-1 balloon, when fully inflated, reached a height of 174,000 feet, launched by the Japanese space agency JAXA. It uses a polyethylene film only 3.4 microns thick, with breaking strength of 400 kilograms per square centimeter which they developed in 1998. However, it is one thing to send a balloon that high. Is it possible to design airships and a “Dark Sky Station” balanced to float at 180,000 feet or so as he suggests? And then – can you send them even further? Well for a while you are assisted by buoyancy, but not for long. When you get high enough, the air rather quickly gets so thin there is almost no lift. However, the equation that defines the Karman line has a variable for the wing area, and another for the lift. There, ρ is the density of the atmosphere V0 is the velocity for a circular orbit at that altitude in a vacuum, S is the wing area, CL is the lift, m is its mass and g is gravity. So, you can fly in a lower density atmosphere, and so higher in our atmosphere, if you have either more wing area, more lift, or less mass. Above around 330,000 feet (depending on the design) then a conventional plane needs to fly at orbital velocity to get enough lift to counteract its mass. But if you can increase both wing area and lift, while not increasing the mass by the same amount you can decrease the density of the air needed for aerodynamic flight and so increase the height of the Karman line. The Karman line will be somewhat higher if the wing area of the vehicle is greater. Also, if you can design a vehicle with more lift for the same wing area, again, then the line will be higher. So where is the Karman line, if your airship has a wing area of square kilometers, and its wings are extraordinarily low mass for their wing area and amount of lift, with a skin made of thin film polymers that couldn’t survive even a slight breeze at ground level? That’s the big question here. He is not going to get to the height of the ISS with aerodynamic lift, but that’s not his aim. His aim is to use aerodynamical lift to get high enough in the atmosphere to reduce the atmospheric pressure, and so the drag significantly. At whatever height it reaches, it then accelerates, kept aloft by aerodynamic lift, and perhaps rising a bit more as it gets faster, until it reaches orbital velocity. Then once it reaches orbital velocity, it can slowly accelerate into a higher orbit like a conventional spacecraft. The drag depends in a complex way on the atmospheric density and the speed, with variations in the drag coefficient. .I think the physics and modeling of this is likely to be rather complex and also to need wind tunnel and practical tests to check it out, if there are any gaps in the data measured so far. His idea only works if they get aerodynamical lift while traveling at hypersonic speeds as they accelerate to orbital velocity. He can’t do it on the thrust alone. But the acceleration can all happen in a thin layer at the top of the atmosphere, in a sweet spot which he says exists with enough lift to hold up its weight, and yet the air is still so thin so that there is hardly any drag. If he can find a layer like that for his airship, then there is no need to rise any higher until they reach orbital velocity. Many physicists seem certain that these airships are impossible. But after taking into account everything they say, and also taking account what John Powell says in his book and talks, I haven’t yet been persuaded by their arguments, and feel it remains a possibility that these airships just possibly might be able to get us to orbit. I don’t think even the most enthusiastic supporter of his ideas would go much further than that, to wonder if they just possibly just might be possible. Please have a read and see what you think, and comment,. Do explain what I am missing here, if you are one of those physicists who are sure that his idea is totally impossible. Also, there are lots of really neat physics ideas involved, which are fun to think about, whether you think it will work or not. If you are a physicist or engineer who hasn’t come across it before, you may find that it’s fun just to think over whether it might work or not, and how far they can go. Also the discussion is so often a “yes / no”. But they have so many stages on the way into orbit. How far do you think they can go, if they can’t go all the way? Also, if JP can’t do it the way they plan to, is there any other way that it could be done? Anyway let’s start with an introduction to the company, and with the much less controversial idea of airships re-entering our atmosphere from orbit. It’s easy to see how an airship can achieve re-entry, as you will see, and I think just about everyone is agreed on this point, including scientists who plan to use such airships to explore the Venus and Titan atmospheres (do of course comment if you think they can’t). The tough thing is to see how they can accelerate to orbit. Their idea is that they don’t do any big expensive “succeed or go bankrupt” type tests like SpaceX did in their early years. Instead every stage along the way pays for itself. At present they pay for the tests through pongsats and other ways to lift material to the edge of space. Their tests involve high altitude balloons, and V shaped airships rated for the lower atmosphere. They have also tested a high altitude balloon based airship design. JP Aerospace hold the altitude record for an airship, propeller driven, remotely controlled from the ground, and flying at a height of 95,000 feet above sea level. Later on they plan a “dark sky” station at the edge of space which will be of a lot of interest for itself both scientifically and for tourists. It gets the name because at that height the sky will be dark even in daytime, as for the Moon. Next, they plan small airships doing test hypersonic glides back to Earth. Finally they do test flights to orbit with smaller airships, then the first human pilots to orbit, and then huge orbital airships with passengers and cargo. The idea started off as a US Air Force contract for a near space reconnaissance airship. But the US canceled the contract in 2004 or 2005 after first persuading them to attempt to launch one of their prototypes for a lower atmosphere airship in a 50 mph wind (which would count as a “strong gale”). It was only rated as sturdy enough for launch in a 2 mph wind at the time (an airship is particularly vulnerable in the short time it takes to launch it from the ground). They did this with some reluctance – and it blew apart in the strong winds, causing some minor injuries. The inventor himself sustained three broken ribs. That was enough for the US Airforce to cancel the contract. JP Aerospace have now solved the problem and can launch their lower atmosphere V shaped airships in any wind conditions. You can read their account of this story here. It’s now a civilian company entirely self financed, and they are not interested in any more such contracts, naturally enough. It’s probably going to take them a fair while, with this approach, maybe decades but it’s interesting: “watch this spot”. It has no internal girders. Its outer shell covers an interior of many large bags of hydrogen to give it rigidity and to stop the gas bunching up at its nose. It also has inflatable trusses, with nitrogen filling the gaps in between these components. The nitrogen is vented if necessary and then replaced from liquid nitrogen tanks. Note the use of airbeams – at this altitude they would consist of very thin materials, that nevertheless give it some strength because of the cylindrical shape. It is balanced to float at anywhere between 140,000 and 180,000 feet altitude in the atmosphere. But since it is aerodynamic, it also behaves like a glider when descending. It doesn’t look much like a glider to our eyes perhaps, but that big voluminous V shape makes a great glider in the very tenuous upper atmosphere during re-entry. So what keeps it up is partly aerodynamic lift and partly buoyancy. 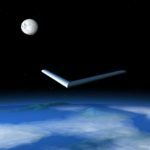 As it descends from orbit, then to start with it is kept up mainly through aerodynamic lift, as it slows down on its long glide through the upper atmosphere. The aerodynamic effects keep it higher in the atmosphere for longer, and so keep it cooler on the way down. As it slows down to a halt in the atmosphere, it’s finally kept up by buoyancy. Many details of the design are given in their Floating to Space: The Airship to Orbit Program. They don’t actually give expected skin temperatures. But the design uses nylon rip-stop polyethylene (page 111) which suggests that they expect external skin temperatures well below 100 °C (212 °F) for continuous use. That seems reasonable to me, I don’t see meteorite damage as being an issue. What do you think? This entry was posted in Airships, High Altitude Airships and tagged JP Aerospace, LH-1, Lockheed Martin, Orbital Airships. Bookmark the permalink.